A memory map is a layout of how the memory maps to some set of information. With respect to embedded systems, the memory map we are concerned about maps out where the Flash (ROM), peripherals, interrupt vector table, SRAM, etc are located in address space. Memory mapped IO is a a means of mapping memory address space to devices external (IO) to the CPU, that is not memory. It all depends on the CPU and the system designed around it. Port mapped IO uses additional signals from the CPU to qualify which signals are for memory and which are for IO. On Intel products, there is a (~M/IO) pin that is LOW when selecting MEMORY and HIGH when it is selecting IO. The neat thing about using port mapped IO, is that you don't need to sacrifice memory space for IO, nor do you need to decode all 32-address lines. You can limit yourself to just using 8-bits of address space, which limits you to 256 device addresses, but that may be more than enough for your purposes. From this you can get an idea of which section of memory space is used for what. This can be found in the UM10360 LPC17xx user manual. If you take a closer look you will see that very little of the address space is actually taken up. With up to 4 billion+ address spaces (because 2^32 is a big number) to use you have a lot of free space to spread out your IO and peripherials. The LPC17xx chips, reduce bus line count, make all of the peripherals 32-bit aligned. Which means you must grab 4-bytes at a time. You cannot grab a single byte (8-bits) or a half-byte (16-bits) from memory. This eliminates the 2 least significant bits of address space. Please read the following code snippet. This is runnable on your system now. Just copy and paste it into your main.cpp file. low then high after some time. Pin P1.0 is connected to an LED. Notice "const" placement and how it is placed after the uint32_t *. This is because we want to make sure the pointer address never changes and remains constant, but the value that it references should be modifiable. The above is nice and it works, but its a lot of work. You have to go back to the user manual to see which addresses are for what register. There must be some better way!! Take a look at the LPC17xx.h file, which It is located in the SJSU-Dev/firmware/lib/L0_LowLevel/LPC17xx.h. 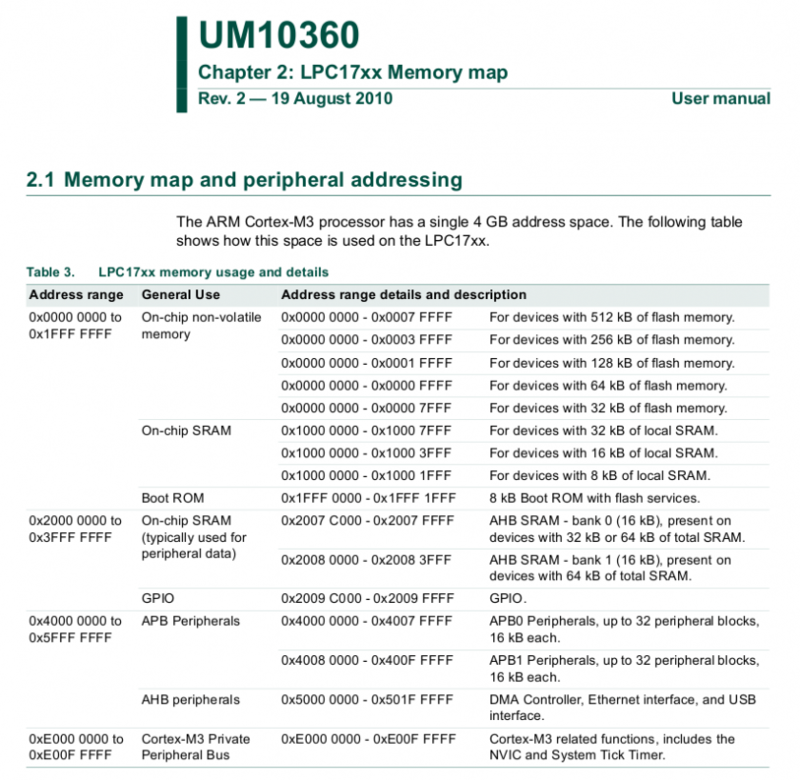 Here you will find definitions for each peripheral memory address in the system. You will find a struct with the name LPC_GPIO_TypeDef. Now search for "LPC_GPIO_TypeDef" with a #define in the same line. We want to use LPC_GPIO1 since that corrisponds to GPIO port 1. At first this may get tedius, but once you get more experience, you won't open the LPC17xx.h file very often. This is the preferred way to access registers in this course. On occassions, the names of registers in the user manual are not exactly the same in this file.